A young man struggles with his ideals in a turbulent world of riots, political unrest, and revolution. Despite bitter opposition he forges ahead, creating a theatre movement that continues to resonate throughout the world to this day. The place is Russia, the man is Meyerhold, and the sheer power of his art and times will inspire and arouse even the most cautious among us. 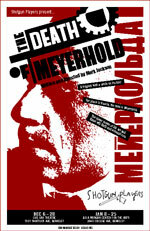 Based on the life of the great Russian theater director, Vsevolod Meyerhold, The Death of Meyerhold is an epic piece of theater about a man whose spectacular life and death rendered him as ambiguous and strangely silent in History's record as he was brash and vocal while he lived. Meyerhold was a politically and artistically provocative artist who made his indelible mark during the early decades of Revolutionary Russia. In a time when life was harsh, change was sudden, and confusion was high, Russia's theater served as a major outlet for alternative and Soviet views alike. The business of making plays gave voice to progressive ideas in a paranoid society of secrets and locked doors, where making a philosophical mistake in public could cost you your life. On Stalin's order, Meyerhold was shot in 1940 and his existence literally erased from the pages of history. Since his name was "rehabilitated" in 1956, Meyerhold's work and reputation have slowly been restored. With the collapse of the Soviet Union in the early nineties, Meyerhold's techniques are now taught freely, openly, and internationally, and his own dramatic story can at last be fully appreciated. In The Death of Meyerhold, the chaotic atmosphere of early Soviet Russia is brought to life through the smoldering personalities of theatrical luminaries. Among the personified are such legendary figures as Clifford Odets, Anton Chekhov, Konstantin Stanislavsky and, of course, Meyerhold himself. Moving across vast landscapes of time and space, the play carries us from Meyerhold's early days as an enfant terrible of the Russian stage during the Tsar's final years to his own tragic death, caught in the wheels of Stalin's terror machine. "Meyerhold is a singular figure," said Mark Jackson, writer and director of the project. "I was first drawn to his techniques, and then to the man himself. History has left the reality of his politics up for debate, which makes him fascinating. In a letter to Chekhov he wrote that he wanted to burn with the spirit of his time, and he did. He called his theatrical style 'Grotesque' because that is how he saw the world: full of contradiction. Working on this play, I've been struck by so many connections between Meyerhold's era and our own - from issues of idealism and freedom of speech to the increasingly ambiguous nature of America's own politics." Mark Jackson is the founder of Art Street Theatre ("San Francisco's Best Experimental Theatre Company" -SF Weekly) for which he has written and directed the plays Io - Princess of Argos, Messenger #1, BANG, Brave, R&J, and Little Extremes. His one-man show, I Am Hamlet, received a 2002 Bay Area Critics Circle Award. Other awards include three SFBG Upstage/Downstage Awards, the 2001 SFBG Goldie Award, and the 1998 SF Weekly Black Box Award. Jackson was recently a resident playwright at the Djerassi Resident Artists Program. Shotgun, after long admiring the work of Jackson, has been excited about the development of this project since the idea was first presented in July 2001. Additionally, Shotgun actors have had the opportunity to train in Meyerhold' s acting system of Biomechanics with Gennadi Bogdanov, a second-generation Meyerhold student, and local teachers Gillian Chadsey and Mark Jackson. Artistic Director Patrick Dooley says "producing this epic piece of theatre which has such socially and politically relevant subject matter - and by a local playwright who has worked and trained with our company for 2 years - this is the kind of theatre we've been working towards for the last 12 years." Some may question the wisdom of doing a play with "death" in the title and set in the Russian Revolution for the holidays, but fear not - The Death of Meyerhold is "tragedy with a smile on the lips," as Meyerhold would say. Bring the family. The cast will feature regulars from both Art Street and Shotgun's stages. Art Street actors Kevin Clarke and co-founder Beth Wilmurt will join Shotgun's Andy Alabran, Reid Davis, Patrick Dooley, Dave Maier and Clive Worsley. Newcomer Cassidy Brown will take on the role of the famed Russian Wunderkind. Isabelle Ortega plays Meyerhold's fiery wife, Zinaida Raikh. The design crew includes sound designer Jake Rodriguez (Skriker for Shotgun; I Am Hamlet, Messenger #1 and others for Art Street), and light designer Rob Anderson (Oedipus Rex and Water Principle for Shotgun), and Shotgun company costumer Valera Coble. Playwright Mark Jackson, scholar Mel Gordon and actor Cassidy Brown talk about Meyerhold's accomplishments and "biomechanics." >> Shotgun makes the Chronicle Editorial Page!!! You know you're on a roll when they're writing editorials about you. Check out this article in the S.F. Chronicle about Shotgun and Meyerhold. "Two small theater groups join forces for major triumph"
"Shotgun Players rally troops for fascinating Meyerhold"
"Shotgun Players Go All Out for Meyerhold"